ABT has posted some Whipped Cream costume photos on its website. There are some very imaginative designs including the costume in which Justin Souriau-Levine seems to have graduated from the Little Mouse in Nutcracker to the Master of Ceremonies in Whipped Cream. How time flies. 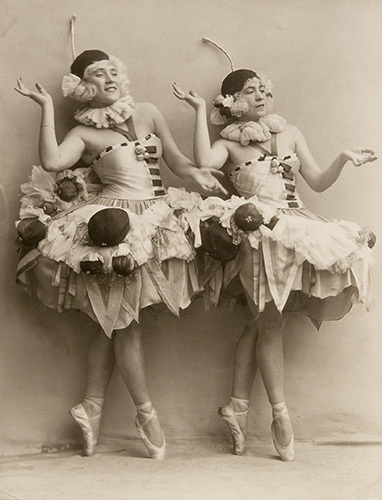 Before anyone begins grumbling about this production being copied off of The Nutcracker, please be aware that the original Whipped Cream ballet, under the German name Schlagobers (1924), preceded the popularity of The Nutcracker which had its first performances in the U.S. in 1944. The costumes from 1924 were pretty outlandish. Here is a link to an image of the original production at the Vienna State Opera maintained at the U.K.'s Lebrecht Music and Arts Photo Digital Library. Here's another one from Theatermuseum - Straus und die oper. Here's hoping that ABT knocks it out of the park with this production and that it draws a lot of interest from the family-oriented audience. It's odd how there is no mention from ABT that Ratmansky already choreographed this ballet in 1994 with Tatiana in the lead. We're wondering if this is all new or if it is part revision. It doesn't really matter. Today's choreographers don't seem too keen on revising their works after the initial publicity dies down; so, if an important one shows that it can be done successfully, that will be a plus – maybe even start a trend. Looking forward to the premiere. We will be announcing the full lineup for Lincoln Center Festival on March 20, so stay tuned. This is going to be such a huge event!!! Speaking of huge events, don't forget about the April 14th YAGP tribute to Julio Bocca which will also mark his 50th birthday. What a perfect year it would be for him to move back home to New York. What a perfect time it would be for ABT's board to do something about the sorry state of the company's directorship. If more of ABT's board members would get out to see the quality of dancing at NYCB, they would realize what a piss poor job McKenzie is doing. Very few of the ABT dancers, regardless of rank, would qualify for a corps position at NYCB. The difference in institutional achievement is that stark. Is that Monday, March 27 or Wednesday, March 29 for the general public on-sale date for Jewels tickets? Excellent question CMM, because I copied and pasted the info straight from an LCF email. I will see what I can find out. Thanks!! I really hope I can snag a ticket for the Lincoln Center Festival Jewels. Unfortunately, I'm not in a financial position to be a donor at the moment. Hallberg is set to play Albrecht in Oman opposite Murphy. I hope to see that at the Met. Jewels may be an event but have you seen the prices? Orchestra $500 to $110, Second $200 to $110. The lowest price in Third is "only" $75. So much for multiple viewing. Laura, oy. I doubt that the NYCB audience will pay $500 to sit in the Orchestra or $200 for Second Ring. But the local and very affluent French population might pay it. Then expect the remaining tickets to be dumped at the Rubenstein Atrium discount window - discounted 50% down to $250, $100, etc. which is really no bargain at all. The costumes for Whipped Cream are quite imaginative, but the only one that seems conducive for classical ballet is Princess Tea Flower. I hope WC isn't a first cousin of Golden Cockerel, which was mostly about costumes and ethnic dances and placed classical ballet at the periphery. On the other hand, it could be great entertainment, but not something I would pay gala performance prices to see. I can't wait to read what you think, Haglund. Angelica, there is also a classically shaped tutu for Princess Praline which bears a candy cane motif. I'm trying to keep an open mind about the production. I generally dislike it when Ratmansky stoops to having adult dancers behave like juveniles as he does in so much of his choreography that reaches too hard for humor, particularly the "inside" joke. But adults can pull off literally portraying children through the use of sharp charm and subtle detail. I'm trying to keep my expectations low because I really do want/need/hope to enjoy it. Thanks for all the info., Haglund. The big headed costumes in Whipped Cream have me hoping that the ballet might have something of the tone of the German silent films of Ernst Lubitsch, who used big heads in party sequences to great comic effect. Alas, I'm not so sure that Ratmansky can achieve anything like the sly subtlety of Lubitsch. Below is a link to a blog which displays many of the Ryden designs. If you scroll to the bottom you can see the publicity still of Princess Praline with Daniil Simkin as The Boy in his Buster Brown wig. Just below that is a photo of Copeland and Ryden upstaging Sarah Lane as she is being positioned atop the friendly yak figure. I fear this may prove to be a metaphor for the entire upcoming season. Thanks LLF. You may be right in your last observation; however, Princess Praline is NOT, repeat NOT being made on Misty Copeland. It is being made on Sarah Lane with Copeland, Cassandra Trenary, and Skylar Brandt as the other Pralines and backup. Frankly, I think it would be a hoot to observe Misty trying to keep up with those other three in rehearsal. I imagine that she will will have to dumb down the steps in this ballet, too. Some really good seats in Third ring for "only" $75, plus fees, of course. Cameras, at least three, will be placed in the orchestra for all shows. A note pops up to let you know that your $200 or $150 " view may be compromised because there is a camera in front of this seat." They do seem to have blocked off many seats for each camera. DVD or Great Performance to follow? Thanks for the info Laura! I recall from the Facebook livestream announcement of the event that Lincoln Center was working hard to try to figure out a way to livestream the event over the internet or have it presented as a Live from Lincoln Center broadcast. If all of the performances are being filmed, it sounds like that a preparation for a later video. Can't wait to find out. Both Miami and Pennsylvania are really "upping their games" next season. Very ambitious programing from both groups. Thanks Bryan for the heads up about PA Ballet's upcoming season! So, this time "Swan Lake" will be Angel's own production. Sad, but expected. I am glad I managed to catch PAB perform Wheeldon's version two years ago. But "Jewels"...now that is exciting! Yes, it is exciting that so many companies are staging Jewels during its jubilee year! I'm curious, though, why you are "sad" that Wheeldon's production - more than a decade old and far removed from Petipa's original intent - is being replaced by a brand new Swan Lake staged by Angel. PAB has been performing the Wheeldon version since 2004 but you have only gone to it once? This "sadness" is rather conflicting with the degree of your audience support for the old production, isn't it? Being able to see ballet live is a very rare treat for me. I actually have seen Wheeldon's Swan Lake twice during different seasons. The first time I went in cold -- not realizing how much it differed from a traditional production until I opened my program. And I ended up being swept away by it, even though the narrative kind of unraveled in the second half. I still clearly recall getting goosebumps during the beginning of the second act when the huge mirror glided across the stage, the patron walked behind it, and Rothbart appeared moments later as the swan theme swelled. Everything came together for me in that moment. My second viewing was even better. I really enjoyed the first act. I reminded of how much I loved Wheeldon's choreography for the swans; their dancing in the last act was particularly stunning. Most surprising, despite the weak storytelling, I was emotionally invested in the final, believed in Odette and Siegfried -- the wonderful Lauren Fadeley and Ian Hussey -- fighting to find each other in the storm and their heartbreaking pas de deux. I am aware I'm in the minority, yet I shall miss Wheeldon's version. Thanks Rosa. You may not be in the minority at all although there have been observations that attendance waned in the last year that Pennsylvania Ballet performed it. The production is still alive for the time being in other regional companies. But I think a dozen years is a pretty good run for any contemporary oriented production of a Petipa classic. Hopefully you'll give Corella's staging a fair shot. It isn't the first time he will have staged Swan Lake. His production in Barcelona for which he borrowed the beautiful Sarah Lane to dance with him at the premiere was received with great enthusiasm. I have great confidence in Corella's taste and wish that we had him back in New York. I'm extremely excited about the premiere of Le Corsaire tomorrow night!